1. Heat oven to 450F. Poke a few holes in potato with a fork or knife and bake for 45 mintues or until soft. 2. Meanwhile, heat oil in pan. Add garlic and let sizzle for a minute or so. Add spinach and sautee until wilted. Let cool. Remove garlic. Alternative: If you’re in a garlicky mood, crush a clove with a press and sautee with spinach. I was feeling like a light flavor so I could still taste the subtler ricotta. 4. Put the potato back in the oven until the tops are nice and golden brown. Enjoy!! Alternative: If you want to enjoy your potato for lunch at work, here’s how to prepare it. In step 3, do not cut potato completely in half. Just slick the top open lengthwise and pretend the skin is a pocket when you re-stuff it. 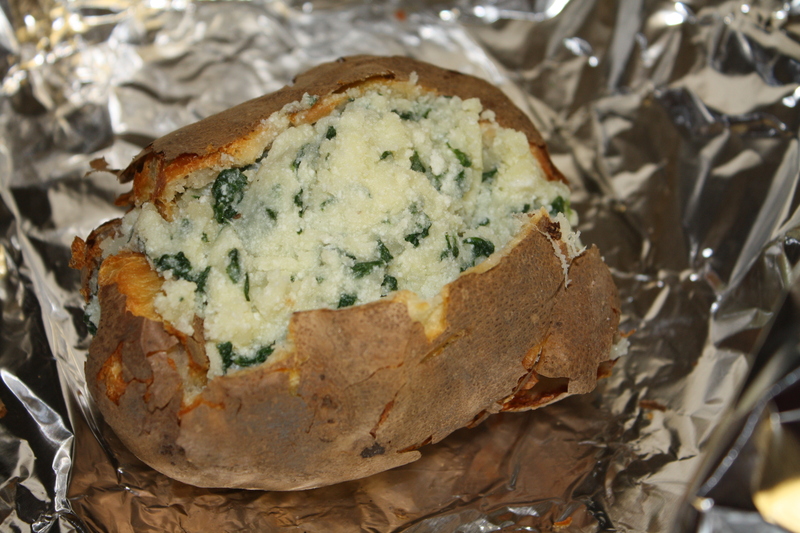 Instead of re-baking it, wrap the potato in aluminum foil. When lunchtime rolls around, unwrap the potato and heat it up in the microwave or (if you’re lucky enough to have one) oven at work. This entry was posted in appetizers, baking, cheese, Sweet Life Laur Original, vegetables and tagged appetizer, baked, lunch, potato, put-back, ricotta, spinach, Sweet Life Laur Original by Laura Zolnoski. Bookmark the permalink. This looks utterly delicious! What a smart idea. You could easily do this on a smaller scale for cocktail parties, too. Love it!